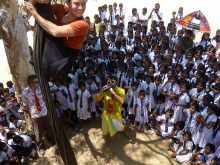 In January 2016, Clowns Without Borders Germany went to Sri Lanka to perform 23 shows in schools, public places, refugee camps, orphanages in Jaffna. In January 2015, Clowns Without Borders Germany went to Sri Lanka to perform 30 shows for 9950 kids. In 2013, Clowns Without Borders Germany sent 4 clowns to Sri Lanka, to perform 24 shows for 6750 people. 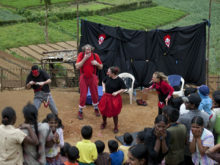 In 2012, Clowns Without Borders France went to Sri Lanka to give workshops to Tamil artists and perform 6 shows in the North for 1000 people. In 2012, Clowns Without Borders Germany went to Sri Lanka and performed 21 shows for 7500 people. 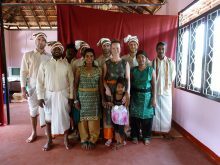 In 2011, Clowns Without Borders France went to Sri Lanka to support returnees and Tamil. They did 18 shows and workshops, for 10000 people in total. In 2011, Clowns Without Borders Germany went to Sri Lanka and performed 23 shows for 3069 people. In 2010, Clowns Without Borders Germany went to Sri Lanka and performed 17 shows for 2800 people. In 2008, Clowns Without Borders Belgium went to Sri Lanka, in the villages affected by the tsunami . They performed 25 shows for 5000 people.